Who said electric vehicles were a new idea? GMC electric, 1913. Here are 3 genuine GM dealer postcards I have of 60-66 GMC's. 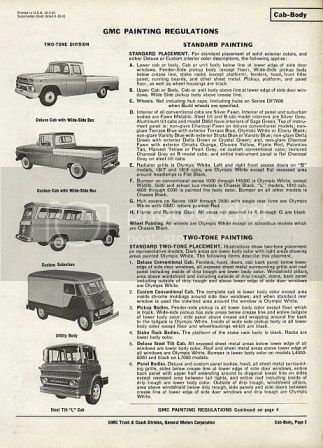 Interestingly, I own a 1960 GMC Suburban that came factory Red and White so it was identical to the one in the postcard, and I am getting a 64 GMC on the 5th of April out of Western Kansas that looks identical to the two-tone pickup in the other postcard. I also owned a 65 GMC Suburban identical to the one in the 3rd postcard....how ironic! Before 'n after on the fire truck. I want to live where a chicken can cross the road without her motives being questioned. This thread upgraded to Sticky by request. I just ran across this article for GM and GMC history. They have old truck pics so i thought id share. total of 6 pages. next ones coming...Click once to view bigger, click again to view huge. I know you historical nuts have all been waiting for the next bit so here it goes. Final coming later this week.